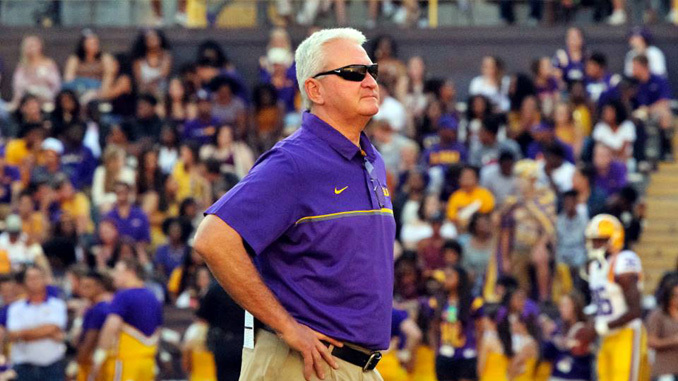 On Tuesday, LSU announced the hiring of Steve Ensminger as the new offensive coordinator in Baton Rouge for Ed Orgeron’s Bayou Bengals. Ensminger, a former QB at LSU from 1976 to 1979, served as the tight ends coach this season – a position he held in Baton Rouge on Les Miles’s staff since 2010 until taking over as OC after the last season’s loss to Auburn. 4 games into the 2016 season, Ensminger was hired to the offensive coordinator position when Ed Orgeron was elevated as interim head coach. Before Ensminger was elevated to offensive coordinator – a job he turned down, but was told he could not turn down by Orgeron – LSU’s offense had only scored 9 touchdowns in 4 games, and was averaging 18 points and 339.5 ypg. Ensminger was elevated to offensive coordinator and quarterbacks coach on Sept. 25, 2016 and his impact over the final eight games of the season was remarkable. Before Ensminger took over play-calling duties, LSU’s offense had scored only nine touchdowns and was averaging 18 points and 339.5 total yards per game. In eight games under Ensminger, LSU improved drastically in every offensive category as the Tigers averaged 32 points and 464.9 total yards per contest during that span. LSU scored 38 or more points five times under Ensminger, including 54 in a win over Texas A&M and 38 against both Arkansas and Ole Miss. The Tigers averaged 7.1 yards per play and converted 46-of-102 third-down opportunities during that eight-game stretch. Also under Ensminger, LSU’s offense set school records for yards in a SEC game (634 vs. Missouri), single-game rushing yards by an individual (284 by Leonard Fournette vs. Ole Miss, 285 by Derrius Guice vs. Texas A&M), longest run from scrimmage (96 yards by Derrius Guice vs. Arkansas) and time of possession ([42:33] vs. Missouri). Individually, Ensminger’s offense produced a pair of All-America selections in center Ethan Pocic and Guice at running back. Pocic was a finalist for the Remington Award as the nation’s top center, while Guice rushed for 1,387 yards and 15 touchdowns. Ensminger has had coaching stints at Louisiana Tech, Georgia, Texas A&M, Clemson, Auburn, and several other schools before hopping on at his alma mater. So now that we’ve got the “news” portion of this out of the way, what exactly does Ensminger’s hiring, and the $10M extension of defensive coordinator Dave Aranda mean? Well, let’s first take a look at what we know about the 3 headed monster down on the bayou now. Coach Ed Orgeron was given a 5 year contract worth $3.5M per season before the 2017 season. The most important part of the contract, for the purposes of this article, is his buyout. Orgeron’s two-way buyout with the program is $12 million this year and drops every subsequent year of the contract. It slips to $8.5 million in 2018, $6 million in 2019, $4.5 million in 2020 and just $1 million for the final year. Coach That means after his 3rd season, the 2019 season, Orgeron’s buyout will be minuscule. If things turn ugly quickly in the next 2 seasons, LSU has an out. The insane $10M, 4 year extension for defensive coordinator Dave Aranda set a precedent at LSU that, for all intents and purposes, showed that the defensive coordinator is every bit as important, if not more so, as Orgeron, the head coach. To pay that much to an assistant coach, along with certain incentives, is beyond comparison. The head coach makes $3.5M per year, and now the DC makes $2.5M. There’s not another staff in the country where the percentage is that close. And as far as the “incentives” go… nothing has been confirmed, but you know it had to be intense. LSU beat writer Ross Dellenger went on 104.5 FM in Baton Rouge with Jordy Culotta and T-Bob Hebert and talked about it. That’s some incredible stuff. Giving an assistant coach the power to make coaching staff hires? This move to give all of this to Aranda just SCREAMS that LSU does not trust Ed Orgeron. But then the Baton Rouge brass turn around and give Ed Orgeron the power to hire the person he wants as his offensive coordinator, which goes completely opposite of where the Aranda hire seemed to point. Ensminger did amazing things in his 8 games as offensive coordinator, but how much of that was just a breath of fresh air, and how much was actually scheme? And, on top of that, he put up numbers against weaker defenses. Under Ensminger, LSU put up 0 points at home against Alabama, and only 10 points against Florida. The guess here is that this is the cheap hire, with somebody that Orgeron is already close with, and a coach that has plenty of SEC experience. Truth be told, though, it appears to be a move that would setup Dave Aranda as the next head coach if things start to drop off next year or the year after. Remember, LSU is losing at least 5 juniors starters to the NFL draft, along with 9 senior starters. With all the new faces, and a schedule that opens with Miami (FL) in Arlington in Week 1, a road trip to revenge-seeking Auburn in Week 3, and drops a game with Tennessee for a game with Georgia later in the season, things could get ugly in Baton Rouge. Luckily Troy is not on the schedule next year… but there is Louisiana Tech that hung 50+ on SMU in their bowl game.